Kirk Cousins‘ departure left the Spartans with the quest for a new starting quarterback. Fourth-year junior Andrew Maxwell is expected to take the reins, but since he sprained his knee during practice we took a closer look at his back-up, Connor Cook, during the recent Spring Game. One Game. One Player. One Post. For every game of the 2012-2013 Michigan State Football Season, statebeat.com will take a closer look at one of the Spartans’ (future) impact players. How did they get here? What were their biggest strengths and weaknesses during the most recent game? What can we expect going forward? And before you complain: yes, we know that in College Football one game normally does not make or break an entire career – but nonetheless, we believe that closely analyzing a one-game performance and relating it to the past and future of a given player can still deliver insights that you won’t find in your regular recaps, box-scores or stats sheets. 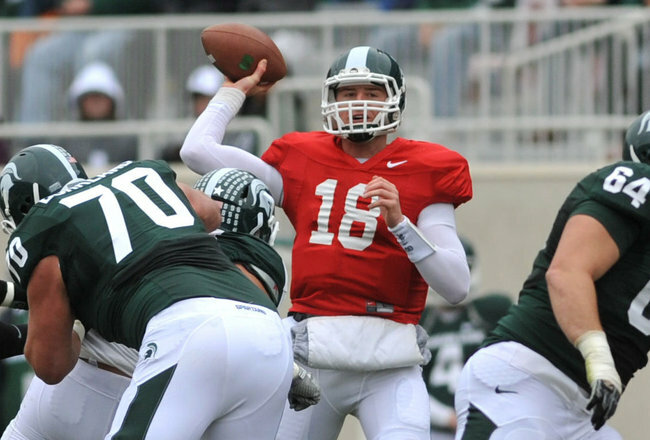 In today’s limelight: Connor Cook (QB, RS Freshman, 6-4 / 215). Is a spring game a valid venue to dissect a player’s performance? Especially if it’s his first game? Probably not. But since the Spring Game was presumably the best (read: only) chance to see quarterback prospect Connor Cook getting extended playing time, we took our chances. Coming out of Walsh Jesuit High School in Cuyahoga Falls, Ohio, the two-year starter (12-7) was ranked among the nation’s top pro-style quarterbacks by MaxPreps.com (No. 9) and Rivals.com (No. 13) and reportedly received scholarship offers from Iowa, Connecticut, Boston College, Cincinnati, Duke and Illinois. But: “Michigan State was at the top of the list. I’m 100-percent solid. When I get mail from other schools I just throw it in the garbage”, he said. And after redshirting his freshman season and working on the scout team (was named Scout Team Offensive Player of the Week vs. Minnesota), Cook entered spring practice as the back-up quarterback, behind Andrew Maxwell. And when Maxwell sprained his knee during a spring scrimmage on April 14th, Cook got to start the Spring Game. Facing one of the toughest defenses in the country can be intimidating – even if they won’t tackle you with full force. Adding TV-cameras and the pressure of stepping into the limelight for the first time to the mix, I won’t blame Cook for having the jitters (what was apparently the case during the Spring Game). Several of the redshirt freshman’s pass attempts were batted down early on as he struggled to get in rhythm. Other passes were off-target (due to a mixture of timing, route running and chemistry issues) or were more of a desperate attempt to get rid of the ball while facing pressure than a controlled throw. But as the game progressed, Cook settled in. He calmed himself down after some incomplete passes by orchestrating a beautiful 97-yard drive to end the 2nd quarter with a touchdown-pass to Andre Sims Jr. in tight coverage. The highlight of that two-minute drill was a 45-yard pass-and-catch to cornerback-turned-wide-receiver Johnny Adams. Adams broke clean off the line, gave himself a couple yards of separation and then caught Cook’s cleanest, deep ball of the day (several other deep balls tended to wobble bit) over his left shoulder, registering the games longest play. But what I liked even more than this impressive drive was Cooks leadership and his discipline on the field. Cook adjusted to the bad start by giving smart audibles and showing leadership in the huddle. He was constantly talking to his teammates, adjusting to the situation and therefore getting more comfortable.“It shows he can take command,” running back Nick Hill said. “He took charge. It shows he’s a tremendous leader. He’s going to be a great quarterback.” In the end, Cook completed 20-of-45 passes for 294 yards with a touchdown and an interception. Don’t expect Cook to come in and immediately perform like Kirk Cousins did during his three years as a starter for the Spartans. He simply can’t. And that’s perfectly fine. Fourth-year junior Andrew Maxwell is expected to be the starting quarterback during the regular season, allowing Cook to spend another year in the backseat learning the college game – just as most other Spartan quarterbacks (Cousins, Hoyer, Maxwell) have done before him. And Cook is eager to do just that. The 19-year-old communicated well with the sidelined Maxwell, who functioned as his private coach. “[Andrew] has helped me out a lot – in practice, in scrimmages, and then today,” Cook said. “He was giving me the signals. I’d come off on the sideline, and he’d come out with my reads, any mistake. Anything I didn’t see on the field, he’d come off and tell me what he saw.” Even more impressive than Cooks eagerness to learn from every snap was the way in which he responded on the field. After he and his receivers haven’t been on the same page early on in the game, he took more and more command of the huddle and pulled off some nice plays. But even if former Spartan wide receiver Keith Nichol alreagy thinks Cook “is only one step away from being the man” and “is going to turn some heads”, I don’t expect him to start anytime soon if Maxwell is healthy. This does not diminish Cook’s skills in any way. He has a great athleticism and can make all throws based on his sound mechanics, but his decision-making and field-vision would greatly benefit from learning behind Maxwell for another year. And after getting some reps as the number one, he knows exactly where to improve. Having said that, I expect Cook to develop into a great signal caller in the future.